de Jong Dream House: Welcome 2016! As I type this, I am enjoying a very low-key New Years Eve with my boys. It's been pretty quiet here on the blog for the last few months. My TBI has been kicking my behind and I have been limping through the end of the year. On the plus side, I have survived another round of Thanksgiving/Sinterklaas/birthday/Christmas craziness. In my pre-TBI days, I spent the last days of year reflecting on what I had accomplished and making goals for the new year. For the last decade or so, I have skipped the resolutions and focused instead on a single word. 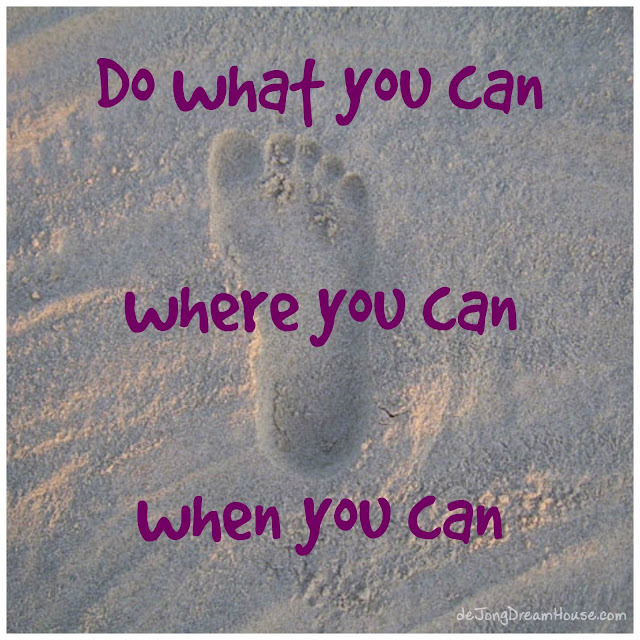 For 2016, I am trading in my word for a phrase: do what you can, where you can, when you can. It's my paraphrase of Teddy Roosevelt's quote," Do what you can, with what you have, where you are." I think it covers the full spectrum of got-my-stuff-together days to can't-get-out-of-bed days. It's motivation for good days and grace for rough days. And every day, it's about making the most of what I have. update the blog more often, even if the post is short and sweet!